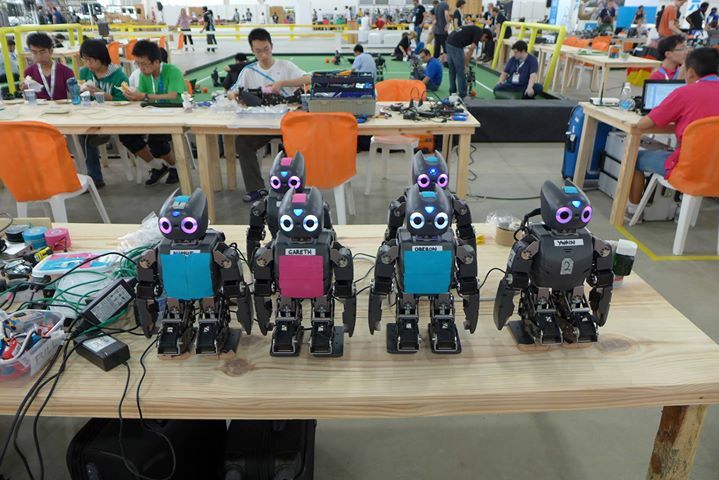 The University of Hertfordshire: Day 1 results from our Bold Hearts robots at the World Cup in Brazil! 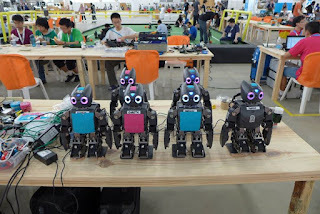 Day 1 results from our Bold Hearts robots at the World Cup in Brazil! Our first day of matches at the World Cup was filled with all the excitement that typically accompanies the Bold Hearts to the RoboCup! As our first match in Brazil loomed, with only two hours to go, and with around 200 wifi networks detectable at the field, our robots could not communicate with each another nor could they receive instructions from the referee's system. This was solved shortly before kick off when one of the network engineers increased the power output of our field's access point, but by this stage we no longer had enough time to run all the tests we needed to run before the start of the game. So our first game against TH-MOS started and semi-organised chaos ensued. The halls were quite dark and the goals difficult to recognise for the robots – so we had problems in goal detection. At half time we were losing 2 - 0, but we did manage to score in the second half, losing 2 – 1 at the end of full time. Our problem of “Own Goalitis” struck again – as we had scored all three goals of the game – which was great for TH-MOS who didn’t manage to score goals for themselves and yet came out as the winners! Four hours later we returned to the same field to try again, this time to compete with the NUbots, an Australian team that has been champions in previous years. Fortified from our recent experience and improved software, the Bold Hearts made a much stronger appearance and won 4 - 1. We again scored all five goals! Overall we're really happy with scoring eight goals in two matches, losing one game and winning one. Although we would have liked all the goals to have been scored in the opposition’s goal! But Bold Hearts is through to the next stage – an intermediate knock-out match with our old friends the Hamburg Bit-Bots!